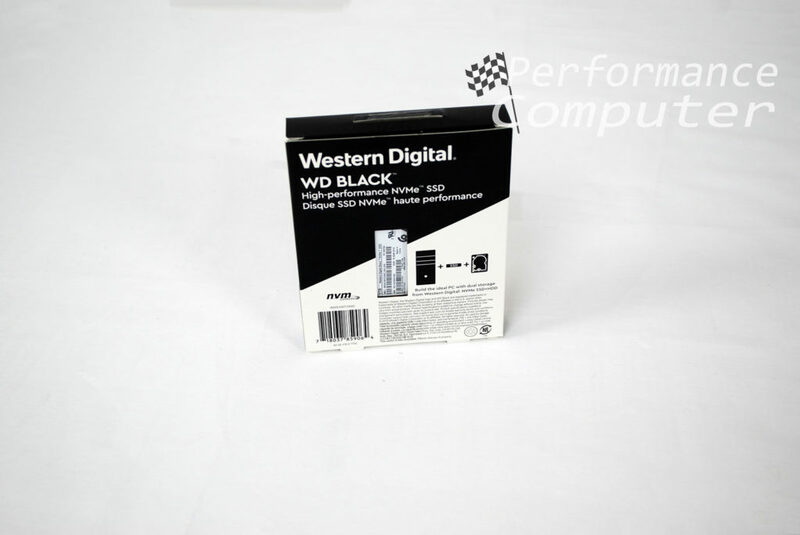 Western Digital has been in the hard drive business since the late 1980’s and has since earned a reputation for building reliable data drives, a noteworthy distinction given how vital our digital data has become. Fast forward to 2018 and they now compete in the highly competitive NVMe SSD market. Their flagship product is the WD Black NVMe 1TB M.2 SSD, it rivals Samsung’s 970 Pro line of NVMe SSDs, but does it even come close in performance and more importantly is it worth your money? Let’s find out. 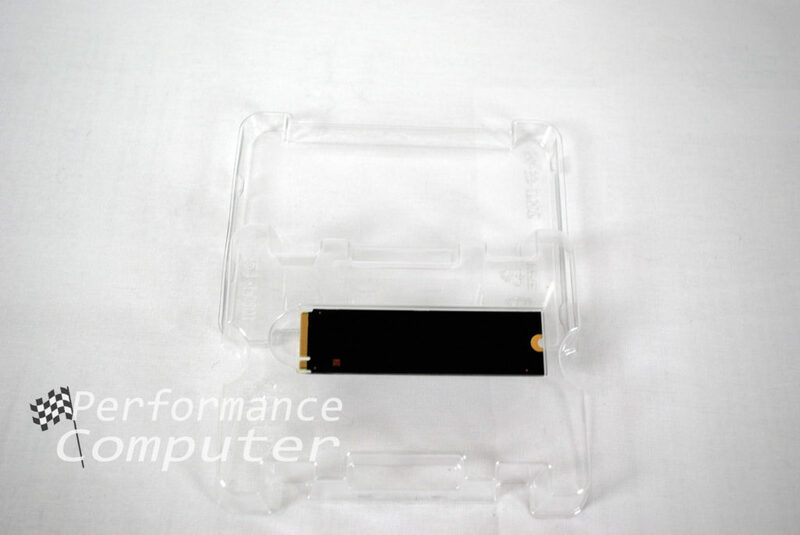 Minimal packaging is necessary for this drive as it has the footprint of a stick of gum thanks to its M.2 form factor. 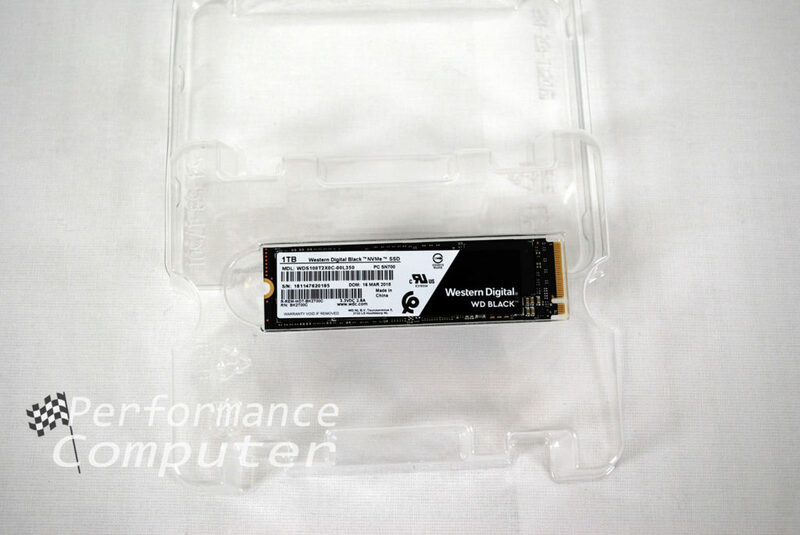 The box displays a picture of Western Digital’s minute powerhouse as well as some statistics that describe maximum read speed, drive capacity, the type of NAND used and warranty. The back of the box has a cutout to show off the drive’s serial and model numbers. Upon unboxing the SSD, you will see just how small it is and if you’ve never seen an M.2 drive in person, its diminutive size is quite striking. To think that Western Digital packed 1 Terabyte worth of storage in such a small piece of tech is truly amazing, what’s even more remarkable is how fast they claim it is. In short, unlike SATA drives, M.2 drives plug directly into your motherboard without the need for cables, provided the motherboard has an available M.2 slot that supports M.2 2280 drives. 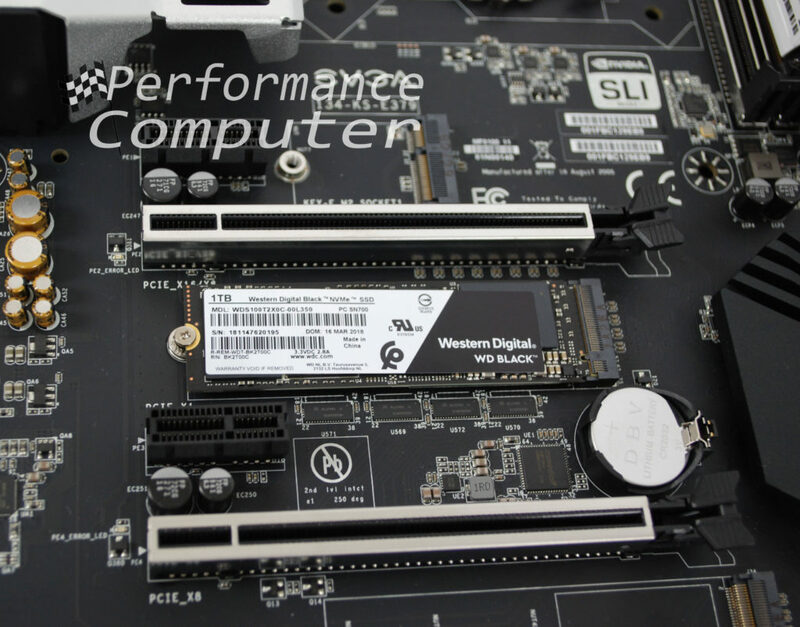 To get maximum performance out of NVMe drives, they need to run in PCIe x4 mode. A full breakdown of 2.5” SATA SSDs vs M.2 NVMe SSDs will be available soon in an upcoming article. We installed ours in the EVGA Z370 Classified K motherboard found in our In Win 101C build guide. On paper, the 1TB WD Black NVMe SSD is capable of read speeds of up to 3,400 MB/s and write speeds of up to 2,800 MB/s. As far as SSD read/write speeds go, these are crazy fast! For years Samsung dominated this market with their 950, 960 and now 970 Evo and Pro series of NVMe drives. However, on paper, the WD Black NVMe trades blows with the 970 Pro’s read speeds while surpassing it in write speeds. What are read/write speeds and why are they important? I for one didn’t pay much attention to read/write speeds when I added the first SSD to my computer. Simply put, reading from a drive is when you access information/data on the drive while writing is when you save to it. Anytime you access a Word document, load a game, open a Photoshop document, etc. you are reading from the drive. When you save that document, your game’s progress or the Photoshop file, you are writing to the drive. Without getting too technical, read and write speeds determine how long it takes to open (read) or save (write) to the device. The higher the numbers, the faster this is accomplished. We will delve into this much further in our upcoming SSD breakdown article. We achieved a sequential write speed of 3,466 MB/s and a sequential write speed of 2,795 MB/s in CrystalDiskMark after five passes. These stats meet or exceed Western Digital’s claims, making this drive a compelling value given that it dethrones Samsung’s 970 Pro, doing so at a much more attractive price point. I should note that the 500GB and 250GB versions of WD Black NVMe M.2 SSD yield slightly slower results, however this is true of lower capacity NVMe drives from all manufacturers. Who is this drive for and should you buy it? Media professionals, video editors, gamers who want the best performance as well as enterprises that employ servers will all benefit from this drive. While not as drastic as your first upgrade from a hard drive to a SSD, tasks are noticeable faster when using an NVMe drive. Boot times are shorter, programs open more quickly, loading times are reduced, searching for files and copying data will all be faster. My boot time was trimmed down to a mere 5 seconds in Windows 10 64-Bit. Admittedly I have few start-up applications, but my previous SATA SSD was far slower to boot, coming in at 11-12 seconds on average. Yes, it was an older drive but I imagine most people that are considering stepping up to an M.2 NVMe drive are already using a SATA based SSD. 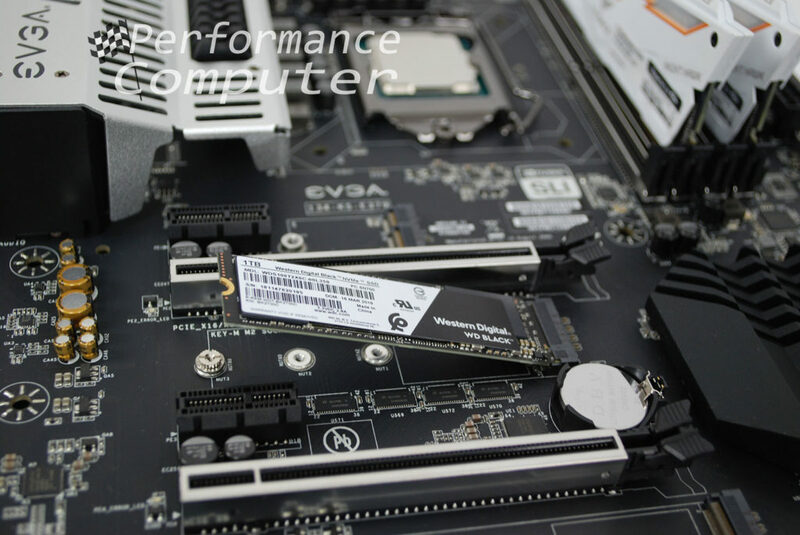 The WD Black NVMe M.2 SSD is without a doubt the best value the NVMe segment right now. At the time of this writing, the WD Black NVMe 1TB SSD is priced nearly $100 less than the Samsung 970 Pro 1TB while matching it in read speeds and besting it in write speeds. Combine that with Western Digital’s confident 5-year warranty and you have a ground-breaking drive delivering blistering performance at an affordable price point. If you are purchasing an M.2 NVMe SSD, I highly suggest getting the highest capacity you can afford. Not only will you gain additional performance, but you’ll have plenty of space in the near term and won’t need to purchase an additional drive for some time. At its current price of $400, the WD Black NVMe 1TB M.2 SSD is a strongly compelling value. It’s faster than Samsung’s venerable 970 Pro, boasts a 5-year warranty and is available in an M.2 form factor eliminating the need for SATA cables. If you’re in the market for an SSD, we highly recommend the WD Black NVMe SSD. Simply put, it won’t disappoint.